Sea turtles, sometimes called marine turtles, are reptiles of the order Testudines. There are seven extant species of sea turtles: the green, loggerhead, Kemp’s ridley, olive ridley, hawksbill, flatback, and leatherback. The leatherback is the largest of all living sea turtles. Mature leatherbacks reach about 1.2 to 1.9 meters (3.9-6.2 feet) and 200 to 506 kilograms (441 to 1,116 pounds). The largest leatherback recorded weighed 916 kilograms (2,019 pounds). 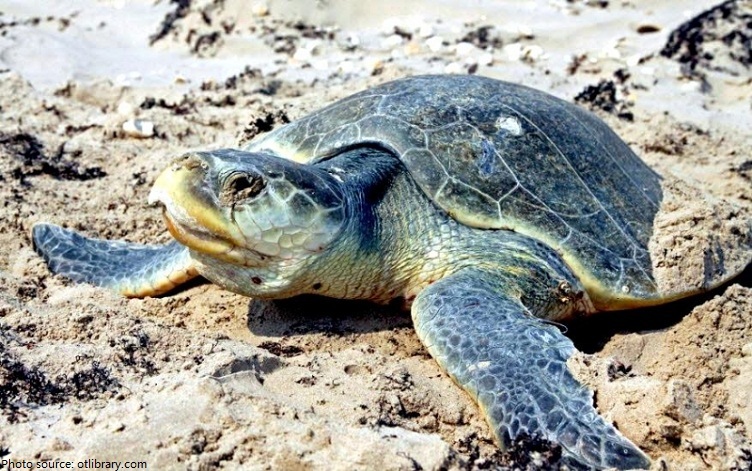 The Kemp’s ridley [pic. below] and olive ridley are the smallest species, and reach about 55 to 75 centimeters (22-30 inches) and 30 to 50 kilograms (66 to 110 pounds). Sea turtle species have varied life spans ranging from 35 to 80 years, although some individuals have exceeded 200 years.Green sea turtles probably have the longest average life span of 80 years. The shortest life span might belong to the Hawksbill or the Flatback at 35+ years. 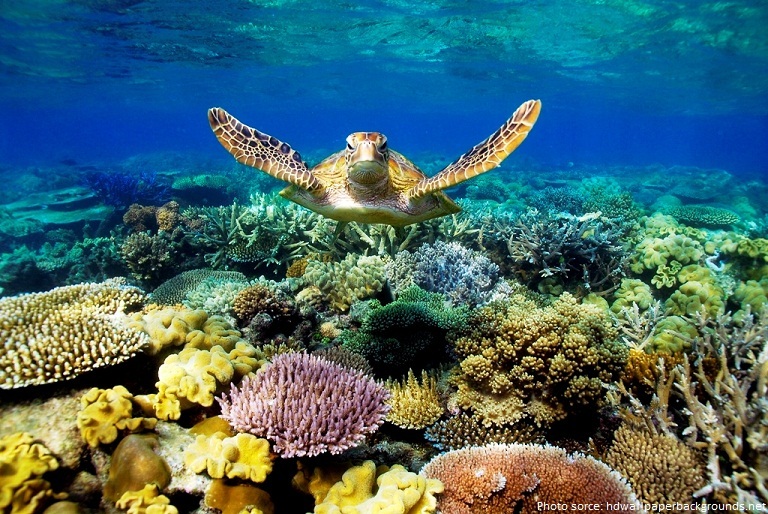 Sea turtles live in all 5 oceans except the arctic ocean, which is too cold. They mostly can be found in coral reefs. Most sea turtles migrate between foraging and nesting grounds, and seasonally to warmer waters. 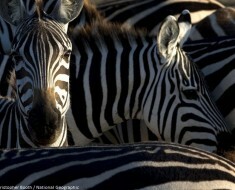 Often these migrations take them hundreds and even thousands of miles. The leatherback turtle is the record holder, traveling an astounding 16,000 kilometers (10,000 miles) or more each year in search of jellyfish, crossing the entire Pacific Ocean from Asia to the West Coast of the US to forage off the coasts of ,Washington, Oregon, and California. 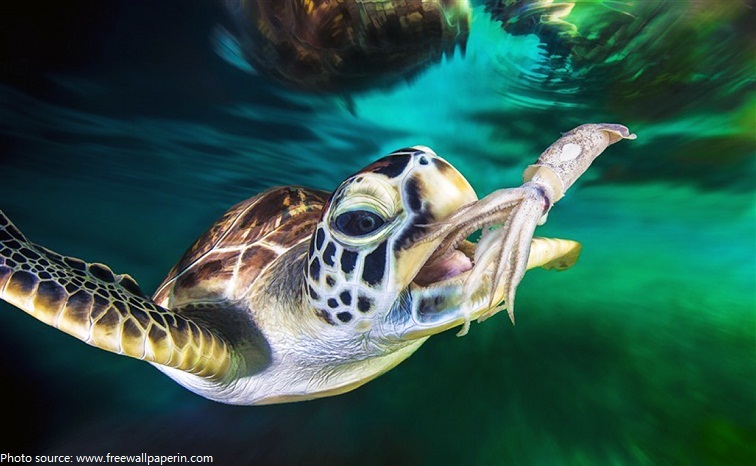 Like humans, sea turtles breathe air into and out of their lungs through their nose and mouth. They go to the surface of the water to breathe and can hold their breath for several hours depending on their activity level. 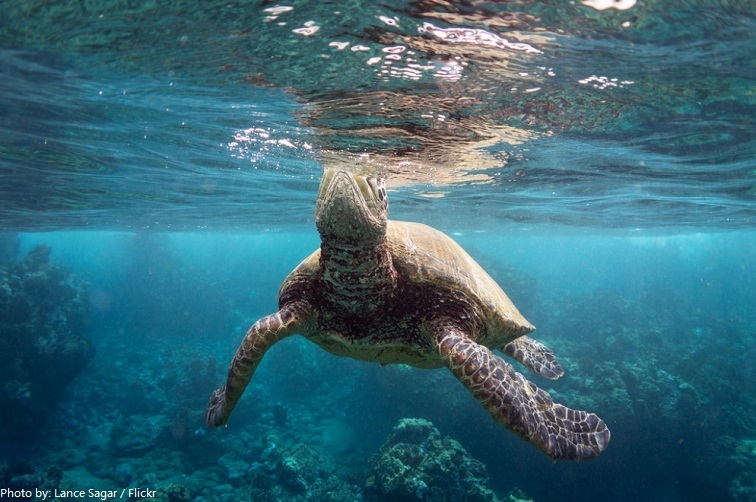 Some turtles have been found to hibernate in cooler water temperatures for several months. They sleep floating or submerged under ledges or laying on the bottom as they can hold their breath for several hours. Depending on the species, sea turtles range can be olive-green, yellow, greenish-brown, reddish-brown, or black in color. Limbs are flippers adapted for swimming. 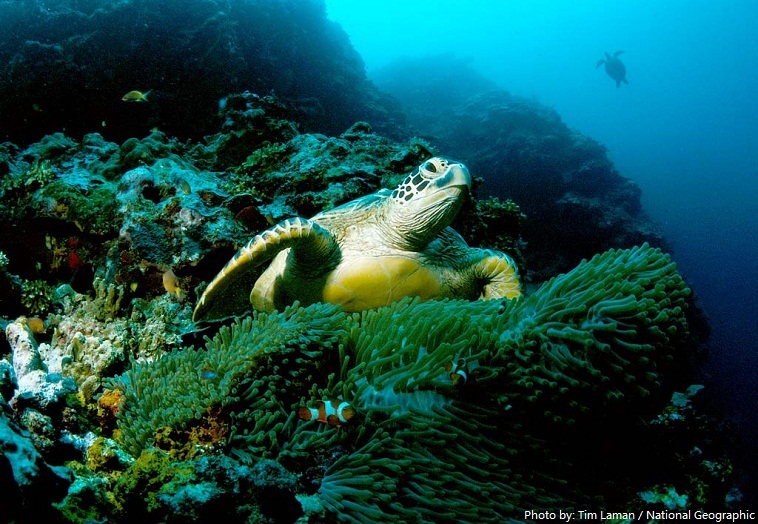 Sea turtles are awkward and vulnerable on land. Unlike land turtles, sea turtles can’t hide their heads and legs inside the shell. Turtles have very unique eyes as they feature eyelids. The eyes are also where the saltwater they take in during eating is excreted which is why some will argue that sea turtles cry. The dorsal (top) side of the shell is called the carapace.Depending on species, the adult carapace ranges in shape from oval to heart-shaped. 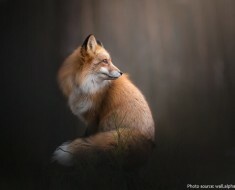 They have a very good sense of smell and use it to find prey. 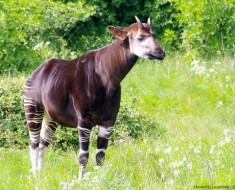 It is believed that the young also use it to find their way to the water for the first time. Depending on the species, sea turtles may be carnivorous (meat eating), herbivorous (plant eating), or omnivorous (eating both meat and plants). Like other turtles, sea turtles lack teeth. Jaw shape varies among species. 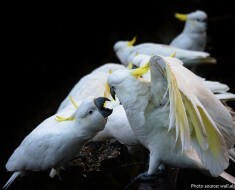 Each species has a jaw shape adapted for its diet. 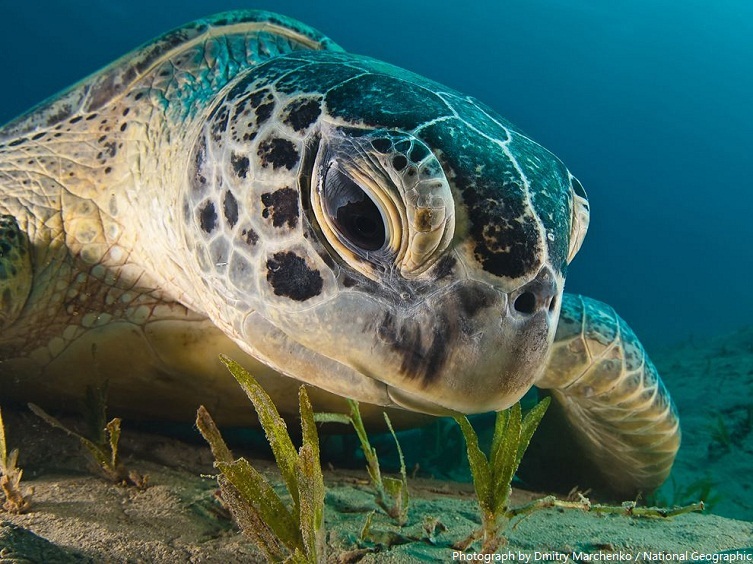 Sea turtles, depending on the species, may eat seagrasses, algae, sponges, sea squirts, squid, shrimp, crabs, jellyfish, cuttlefish or sea cucumbers. Leatherbacks can dive to a depth of more than 1,000 meters (3,000 feet) in search of their prey, jellyfish. The hard-shelled species dive at shallower depths. The leatherback is adapted to deep dives because of its unique morphology.Other types of sea turtles can dive up to about a 300 meters (1,000 feet). The leatherback is the only sea turtle that does not have a hard shell. Instead, it bears a mosaic of bony plates beneath its leathery skin. Sea turtles are not generally considered social animals; however, some species do congregate offshore. Sea turtles gather together to mate. Members of some species travel together to nesting grounds. It takes decades for sea turtles to reach sexual maturity. Mature turtles may migrate thousands of miles to reach breeding sites.After mating at sea, adult female sea turtles return to land to lay their eggs. The mature nesting female hauls herself onto the beach, nearly always at night, and finds suitable sand in which to create a nest. Using her hind flippers, she digs a circular hole 40 to 50 centimeters (16 to 20 in) deep. After the hole is dug, the female then starts filling the nest with her clutch of soft-shelled eggs. Depending on the species, a typical clutch may contain 50 to 350 eggs. After laying, she re-fills the nest with sand, re-sculpting and smoothing the surface, and then camouflaging the nest with vegetation until it is relatively undetectable visually. The whole process takes thirty to sixty minutes. She then returns to the ocean, leaving the eggs untended. 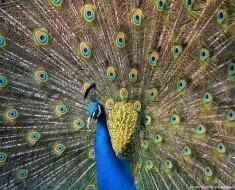 Females may lay 1-8 clutches in a single season. The eggs will incubate for 50 to 60 days. Temperature determines the gender of the baby turtles. Female will be born if the temperature of the egg is high and male if the temperature of the egg is low. The eggs in one nest hatch together over a short period of time. 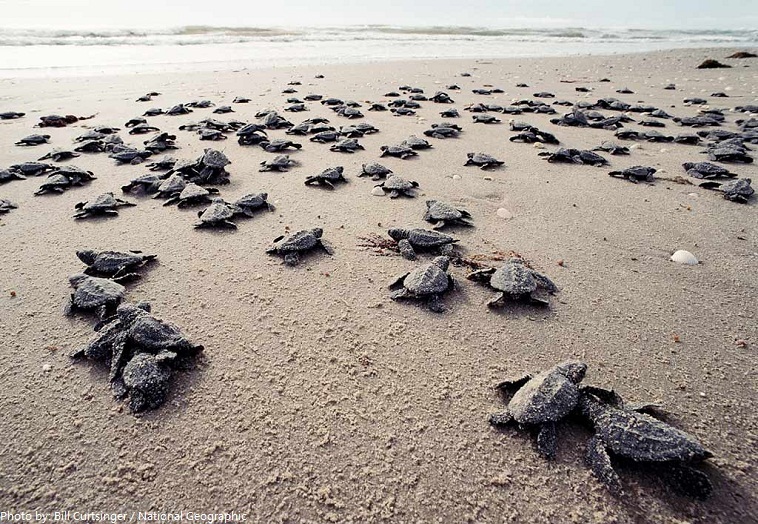 The baby turtles break free of the egg shell, dig through the sand, and crawl into the sea. 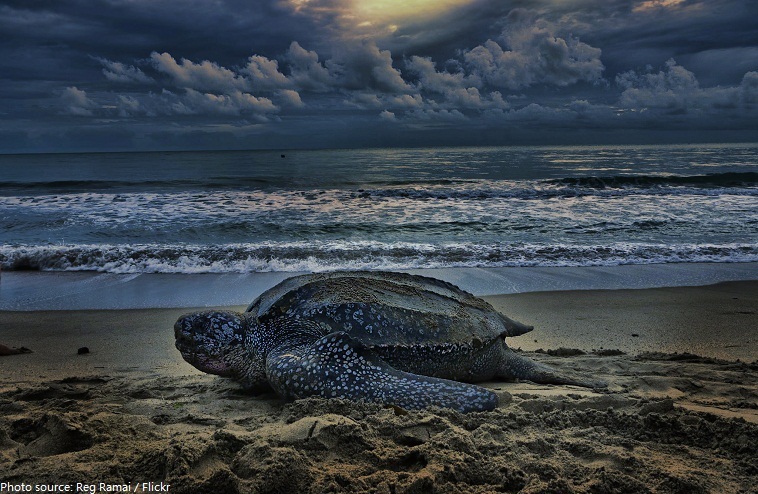 Most species of Sea Turtles hatch at night. Adult sea turtles have a few predators, mostly large sharks. Tiger sharks, in particular, are known for eating sea turtles. Killer whales have been known to prey on leatherback turtles. Fish, dogs, seabirds, raccoons, ghost crabs, and other predators prey on eggs and hatchlings. 5 of the 7 species are endangered with the Olive Ridley considered vulnerable while the status of the Flatback is unknown.Slaughtered for their eggs, meat, skin and shells, sea turtles suffer from poaching and over-exploitation. 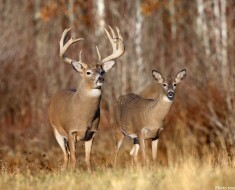 They also face habitat destruction and accidental capture in fishing gear. 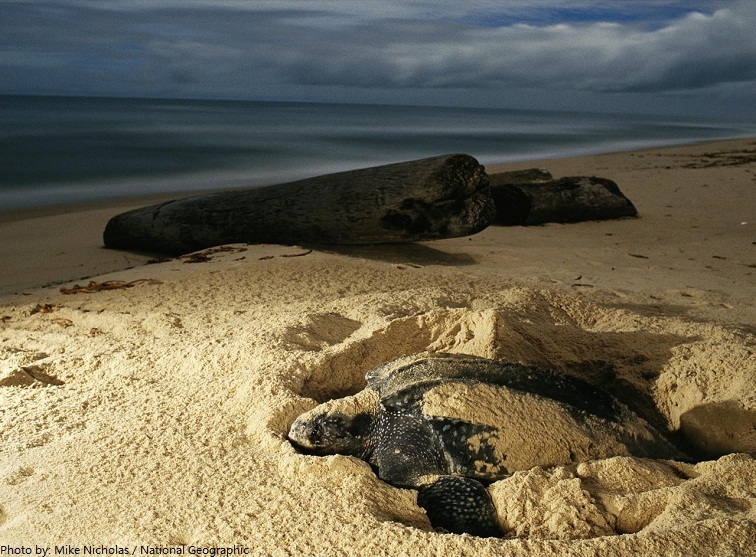 Climate change has an impact on turtle nesting sites. Sea turtles have been around for more than 100 million years and are among the oldest creatures on earth. Some research suggests that sea turtles have the ability to detect magnetic fields and can calculate latitude and longitude but further studies are needed to confirm this. Males never leave the ocean, while females will come ashore to lay their eggs on sandy beaches during the nesting season.